$1,650.00 Badge to a Defender of Port-Arthur, Enlisted Man's Version in bronze, 1914. Very attractive piece in excellent condition. Comes with a period wing nut. $1,200.00 Officer Badge of the 96th Omsk Infantry Regiment, in silver, gold and enamels, 26 mm ("Prinzen" Size), 1908-1917. This elegant piece was possibly commissioned for a Lady of the Regiment - i.e. wife of one of its officers who was actively involved in providing support for the unit. Until now, there haven't been recorded instances of an officer's badge of this regiment being offered for sale (at least according to a recent reference book on the subject). Beautiful and very rare badge in very fine to excellent condition. $950.00 Badge with the Cypher of Emperor Nicholas II, believed to be for the Lower Ranks accompanying the Emperor's Suite, circa 1894 - 1917. A truly enigmatic and extremely interesting piece in excellent condition. $850.00 Badge of the Lower Ranks of the Preobrazhenskiy Guards Regiment, by Kortman, 1909 - 1917. In gilded brass and enamel. Issued to an enlisted man or non-commissioned officer of one of the premier Guards units of the Russian Imperial Army. In outstanding condition; comes complete with original maker marked screw plate. $1,500.00 Enlisted Man's Badge of the 2nd Sofia Infantry Regiment of Emperor Alexander III, 1910-1917 issue. The regiment was completely destroyed at Tannenberg in 1914, so nearly all of its regimental badges perished with their owners. Only a few examples of this badge - all of which are officer level badges - are known to exist today. In outstanding condition. $975.00 NCO Badge of the 17th Nizhniy Novgorod Dragoon Regiment of His Majesty, 1908-1917. In brass and paint, two-piece construction (unlike single-piece badges for enlisted men.) In very fine condition. $850.00 Enlisted Man's Badge of the 22nd Nizhniy Novgorod Infantry Regiment of Her Imperial Highness the Grand Duchess Vera Konstantinovna, 1909-1917. The regiment was one of the oldest and most illustrious among Russian infantry units. It was completely destroyed in an early WW1 battle in East Prussia that had turned calamitous for the Russian Army. Consequently, its badges are among the rarest of Russian regimental badges. Missing the screw plate, otherwise in excellent condition. $280.00 Army Sharpshooter Badge, 1st class (highest level award with Nicholas II cipher), 1909-1917 type, probably a WWI issue. In excellent condition. $150.00 Army Sharpshooter's badge, 2nd cl., circa 1914-1917. In excellent condition. $75.00 Army Sharpshooter Badge, 3rd cl. (in white metal), 1909-1917. Most likely, a WW1 issue judging by simplified construction. The screw on the reverse is a replacement, but the details of the obvers are nicely preserved. $750.00 Badge of a Military Doctor awarded a Doctorate at a Russian University or at the Imperial Medical and Surgical Academy, in hallmarked silver, by an Odessa maker "АФ", 1908-1917. A beautiful, very complex piece in superb condition. Comes complete with original washer and wing nut showing matching "Kokoshnik" hallmarks. $770.00 Badge of a Graduate of the Pavlovskoe Military School of St. Petersburg, 1898 - 1917, by the Rukavishnikov Workshop, Moscow. In hallmarked silver, of very intricate multi-piece construction with the wreath formed by separately applied leaves. In outstanding condition and includes original hallmarked wing nut. $1,250.00 Mikhailovskaya Artillery Military Academy graduate badge in hallmarked silver by a St. Petersburg maker, 1908-1917 issue. A very attractive piece in high 3-d profile. Very fine condition; comes with original silver washer and wing nut. $1,400.00 Badge of a Graduate of the Alexandrovskoe Military School in hallmarked silver with superimposed monograms in solid gold, 1909-1917. Very attractive and elegant piece in fine to very fine overall condition. $550.00 Badge of a Graduate of the School of Navigation, Naval Cadet Corps of St Petersburg, 1910-1917. In brass and enamels. The screw post was replaced with a pin by the original owner, overall in very fine condition. $1,800.00 Badge in Commemoration of the 200th Anniversary of the Naval Cadet Corps, 1901 issue. This exceptionally rare badge was issued only once to the staff of the Corps (Naval Academy) and its current upperclassmen. Very elaborate design consisting of 8 different interconnected pieces in brass and enamels. In fine to very fine condition. $650.00 Chuguev Infantry Officer School graduate badge in silver, #9238, 1913-1917. Attractive piece in Fine to Very Fine condition. $945.00 Nikolaevskoe (Nicholas) School of Military Engineers, Graduate Badge, by Arnd, St. Petersburg, 1910-1917. Massive and very intricately designed badge in silver, solid gold, and enamels. In fine to very fine condition. Includes hallmarked wing nut which is probably original to the badge. $490.00 Graduate's Badge of the Nikolaevskoye (Nicholas') Cavalry School in St Petersburg, circa 1909-1917. Beautifully sculptured piece in gilded brass and enamel. Excellent condition. $1,500.00 Badge in Commemoration of the Centennial of the Cavalry Officer School, 1909. Extremely rare award badge in gilded brass and enamels. The screw plate is replaced, but the badge itself is in superb condition. $1,150.00 Silver and Enamel Graduate's Badge of the St. Petersburg Women's Pedagogical Institute under the Patronage of Empress Maria Feodorovna. Only worn for three years from 1914-1917. In very fine to excellent condition. $195.00 Fiftieth Anniversary of the Court Regulations (Procedural Law), 1914 issue. A very attractive piece in gilded bronze. In superb condition and includes scarce original wing nut. Awarded to distinguished law professionals in commemoration of the Alexander II's court reform of 1864. $650.00 Romanov Tercentenary Cross for the Clergy, bronze (brass gilt) version with cloisonné enamels. Awarded to Orthodox priests who personally participated in special church ceremonies on 21 February 1913 marking the 300th anniversary of the Romanov Dynasty. In very fine to excellent condition. $975.00 Romanov Tercentenary Cross for the Clergy, in hallmarked silver and cloisonné enamels. Awarded to Orthodox priests who personally participated in special church ceremonies on 21 February 1913 marking the 300th anniversary of the Romanov Dynasty. A beautiful piece by a Moscow maker, with flawless enamel and in very fine overall condition. 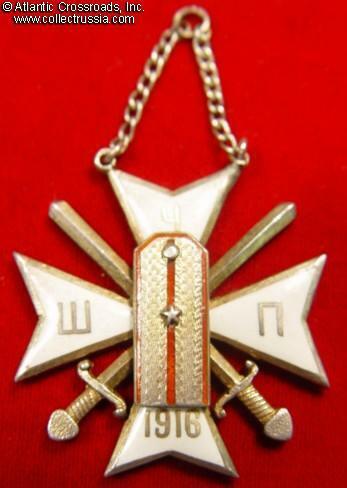 $160.00 Russian Imperial Red Cross Merit Badge in brass gilt and enamels, 1899-1917. An impressive piece in very fine condition. $1,375.00 Red Cross Honor Badge for Men in brass gilt, 1908-1917. A very impressive and scarce piece in excellent condition. $1,300.00 Badge of the Good Samaritans Charitable Society of St. Petersburg, 1902 - 1914. In silver gilt and solid gold, a very attractive badge inscribed with the name of the original owner. In excellent condition. $1,250.00 Badge of the North American Russian Orthodox Brotherhood in Petrograd, 2nd cl., 1915-17. This very large and spectacular badge in hallmarked silver, gold and enamels was issued for less than three years prior to the revolution. In very fine to excellent condition. $1,150.00 Badge of the North American Russian Orthodox Brotherhood in Petrograd, 3rd cl., 1915-17. Very large and attractive badge in excellent condition. $190.00 Rural Court Judge (Volostnoy Sudya) of Kamenets- Podolskiy District, breast badge, 1889 - 1912. In very fine condition. Includes original chains and parts of the suspension bar. $220.00 Rural Court Judge (Volostnoy Sudya), breast badge, 1912-1917. In very fine to excellent condition. $260.00 Soltys (Village Elder), Identification badge,	Polish territories of the Russian Empire, 1904 through 1917.